Note : A prime number (or a prime) is a natural number greater than 1 and that has no positive divisors other than 1 and itself. According to Wikipedia : In number theory, a perfect number is a positive integer that is equal to the sum of its proper positive divisors, that is, the sum of its positive divisors excluding the number itself (also known as its aliquot sum). Equivalently, a perfect number is a number that is half the sum of all of its positive divisors (including itself). Example : The first perfect number is 6, because 1, 2, and 3 are its proper positive divisors, and 1 + 2 + 3 = 6. Equivalently, the number 6 is equal to half the sum of all its positive divisors: ( 1 + 2 + 3 + 6 ) / 2 = 6. The next perfect number is 28 = 1 + 2 + 4 + 7 + 14. This is followed by the perfect numbers 496 and 8128. Note: A palindrome is a word, phrase, or sequence that reads the same backward as forward, e.g., madam or nurses run. 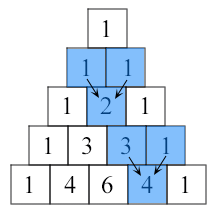 Note : Pascal's triangle is an arithmetic and geometric figure first imagined by Blaise Pascal. Note : Pangrams are words or sentences containing every letter of the alphabet at least once. For example : "The quick brown fox jumps over the lazy dog"